ABOVE: Brightly painted houses are reflected in a Burano canal. INSET BELOW: A chimney on Burano. 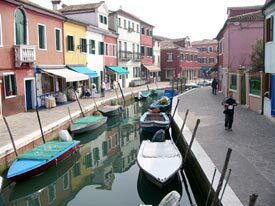 The island of Burano lies in the northern part of the Venetian Lagoon, about 40 minutes from Venice by motorboat. It has a much different atmosphere from Murano or Venice's historic center, thanks to the Buranese custom of painting houses in bright colors--a tradition that may have had its origins in the color schemes of local fishing boats. Everywhere you look, you'll see houses clad in blue, green, pink, rose, lavender, purple, yellow, and other colors. And because Burano's houses tend to be small, the island has a cheerful coziness. It wouldn't be surprising if Burano were used as a model for a family resort at Disney World. Roman Catholics and lovers of solitude may enjoy a side trip to the monastery island of San Francesco del Deserto, where the nine Franciscan monks welcome visitors from 9-10 a.m. and 3-5 p.m. daily. The island is 20 minutes by rowboat from the Burano waterfront. (A gondolier does the rowing.) For more information, or to book an overnight stay, call the monks at 041 528 6863 when you're in Venice. Silvia Zanella, a guide who lives on Burano, offers a "Secret Corners of Burano" tour at very reasonable rates. The daily 45-minute walking tour begins by the ACTV waterbus station on Burano's waterfront. (Kids under 4 are free, and you can bring your dog.) Read our illustrated article about this and other Discover Burano tours. From spring through fall, you can also get to Burano on the No. 14 water bus from Zaccaria via the Lido and Punta Sabbioni.